This is a lowland home to a Honbyakush? (literally-First Farmer) family. This lowland Minka (vernacular built) dwelling is made from Kyoro-Gumi wooden post-framing, with both partial plastered bamboo panels and timber boarded panels. Internally there is the lower 'Doma' of Doza (padded earth) where many household jobs are done, next to that is the 'Hiroma' of 'Taka-Yuka' raised timber flooring, where the family eat and sleep. There are two doorways to the cottage, the main door being 'Shoji' panelled. On the outside of the main door is another door, the Amado (rain/security) door. This cottage has two Hi-en Engawa (full length verandas), one each side, both with Naga-ita (wood planking) roofing. 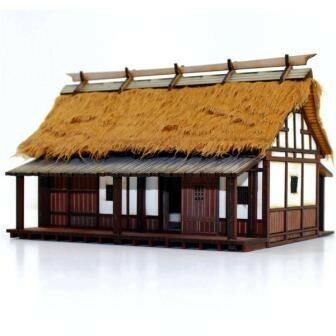 The cottage itself has a Buki (thatched) Kirizuma roof, the mune-jimai (ridge cover) is the relatively common Oki-chi. Of the Hyakushou (Peasant Farmers), Honbyakush? were the highest rank. They would work their own land but more usually their land was worked by Mizunomi (water drinkers). These farmers lived in Mura (villages) of related family groups. Mura dwellers had to answered to their local G?shi (Country Samurai) but for the most part their farming communities ran themselves. Honbyakush? families held village leadership by hereditary right - they had all the say in their village councils and assemblies. Though Honbyakush? had the most power and say in their village they also had the greatest tax burden. As Hyakushou they also still had a duty to fight for their lord as his Ashigaru (levy soldiers),and it was from the Honbyakush? that Gunsou (Sergeants) of Ashigaru were chosen.